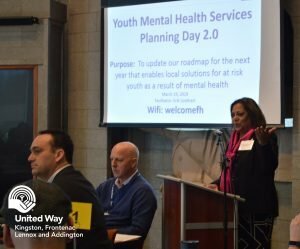 Bhavana Varma, President and CEO of United Way Kingston, Frontenac, Lennox and Addington, kicked off Youth Mental Health Services Plannind Day 2.0 at Fort Henry on March 29, 2019. 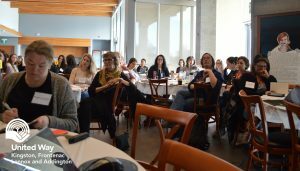 After the inaugural planning day, the group recommended forming a strategic committee to work on some of the priorities identified. 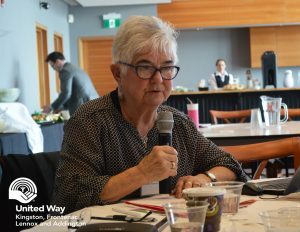 Those in attendance agreed that more needed to be done in relation to transitioning from hospital to community care; United Way and Kingston Health Sciences Centre agreed to co-chair this initiative to keep the momentum going. The day started with MP Mark Gerretsen, MPP Ian Arthur and Mayor Bryan Paterson sharing their commitment to addressing the mental health needs of youth. 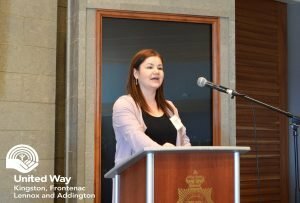 Ashley O’Brien, coordinator at One Roof, was also on hand to give everyone an update on the impact the hub has made for youth in the community. She also emphasized how important it is to continue to listen to youth, a message that echoed throughout the initial planning day and continued to echo during the follow up session. The planning day consisted of a number of facilitated discussions lead by Erik Lockhart, Associate Director of the Queen’s Executive Decision Centre and focused on three main ideas; the need for safe spaces, crisis planning and discharge planning with a lot of attention paid to how youth interact with the emergency department at hospitals. Oliver Hill spoke of his own experiences with mental health services. 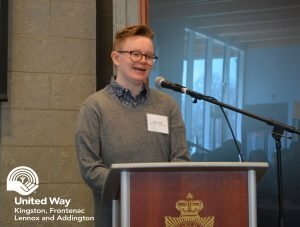 This sentiment was confirmed by local youth Oliver Hill who was one of three youth that spoke over the course of the day of their experiences with mental health issues and mental health support. As a young teenager Hill often found himself seeking support in times of crisis. Hill participated in discussions throughout the day and offered feedback based on his own experiences. 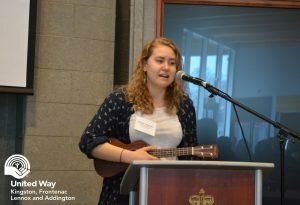 He was joined by Kimaya, who shared her experiences with anxiety through two original songs; Alexis, who spoke of her experience with addictions and mental health and the help she received through Youth Diversion; and Marie Savage, a member of the South East Local Health Integration Network Patient and Family Advisory Committee, who spoke of her experiences with her daughter and her struggle with mental health. 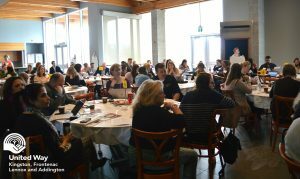 Their feedback resonated with everyone in the room and many appreciated their honesty. “I can look at my own experiences in a negative way and let it eat me alive or I can look at it as a chance to learn and grow and I choose to look at it as an opportunity to help others,” said Alexis. At the end of the day, the group provided input and ideas on an after-hours walk-in clinic for youth, defining a safe space for youth and services to be included, the possibility of developing an app to help youth connect with services, peer support and the need for continuous follow-up with youth post-crisis. Those in attendance expressed gratitude to the youth for bravely sharing their stories and many committed to continue working on these issues and reconnecting in another year to keep up the momentum.